The above info came from Kooshmeister, and was edited by yours truly (contact me). 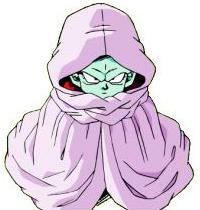 The image came from Bcp Dragon Ball Z kamp 2002. The son of Garlic, an evil little child who had matured both intellectually and emotionally well beyond his years, and wanted nothing more than to take revenge on the entire world for the death of his father. Though small, he was incredibly powerful, and could increase his size and strength at will. He knew the only way he could achieve his goal was to become immortal, so he instructed his minions Nikki, Sansho, and Ginger to gather the Dragon Balls. They were forced to abduct Gohan in the process when the boy refused to give up the Dragon Ball on his hat. He was impressed by Gohan when he sensed the boy's hidden strength, and offered to take him on as his apprentice. When Ginger and the others successfully collected the last of the Dragon Balls, Garlic Jr. summoned forth Shenlong and asked to be made immortal. Shenlong granted his wish, and Garlic Jr. was thus made unkillable. His joy was short-lived however, as Goku arrived looking for Gohan, followed shortly by Kami and Piccolo. Goku and Piccolo managed to kill his three minions, whilst Garlic Jr. succeeded in defeating Kami. When faced by Goku and Piccolo, Garlic Jr. transformed into his more physically powerful state to better fight them. Even though they could not kill him, Garlic Jr. found beating the two to be somewhat of a chore once they removed their weighted clothing. Frustrated, he summoned up all his power and opened a portal into the dimension of black nothingness called the Dead Zone, intending to trap his enemies there. But his plan backfired. Gohan unleashed his hidden strength, knocking Garlic Jr. into the Dead Zone and trapping him there for eternity. Or so they thought. Years later, Garlic Jr. recieved the boost in power he needed to reopen the Dead Zone and escape, courtesy of the Makyo Star. Armed with a new group of followers, Garlic Jr. took over Kami's palace, trapping the Earth's protector and his assistant Mr. Popo inside little glass bottles. Next, he got his hands on an insidious vapor called the Blackwater Mist, which caused all who breathed it in to become evil. This he spread over the Earth. But a handful of the Z-fighters escaped the mist, including Gohan. Laying siege to Kami's palace, they were able to kill Mustard and Salt, and set free Kami and Mr. Popo, who would go on to use the antidote to the Blackwater Mist, the Sacred Water, to return the Earth to normal. Enraged, Garlic Jr. and his remaining two minions drew upon the power of the Makyo Star and transformed into their bigger and stronger states. Still, he found he could not fully crush them, and following the deaths of Spice and Vinegar, Garlic Jr. abandoned all reason and made the mistake of reopening the Dead Zone, and the end result was a repeat of his previous defeat. He was trapped in the Dead Zone again, and the Makyo Star was destroyed, ensuring that Garlic Jr. would never come back. The above description came from Kooshmeister, and was edited by yours truly (contact me).